After having multiple people whose opinions I respect independently (and as far as I can tell, without mutual discussion) ask me to do so, I took a big step today and entered my first "mundane" political election. 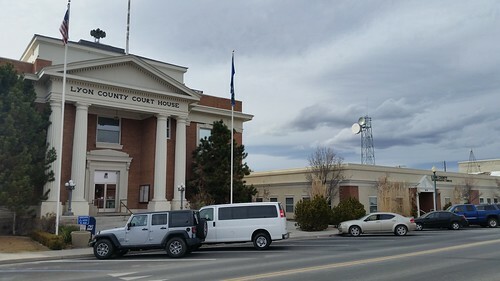 This afternoon, I was able to get away shortly after work to drive the 50 or so miles down to Yerrington to the County Clerk's office (which is in the building to the right of the courthouse). Lisa came along for moral support. I have filed for a seat (two at-large seats are open; top two finishers are elected, and if two or fewer people file, they'll be automatically seated without an election because there's no write-in provision) on the board of the North Lyon County Fire Protection District. All seats are elected at large. The NLCFPD is substantially the same area and contains the same residents as the city of Fernley. (As I understand it, the slight difference between the city and the fire district's areas will be cleared up soon, and the area in question doesn't have anyone living in it.) I'm running for a four-year term on the five-member board (maximum of three terms under state law). Members serve without compensation, and therefore there is also no filing fee, but you do have to go in person to the county clerk's office to file for office, and the paperwork isn't even available on the clerk's web site, so you don't have the opportunity to review it before actually going in to file. After establishing my residency (fortunately my driver's license has my street address to prove that I actually live in the district), the assistant clerk went through a checklist of items with me. One reason for having to file in person is that they have to prove that they provided everything to you, so you sign forms that (among other things) testify that you've received everything and had all of the warnings. Today was only the first step. There are other filings that I have to do online with the Nevada Secretary of State's office, mainly having to do with financial reporting. This is likely to be trivial in my case because I don't expect to do any fundraising or to spend a significant amount of money, but the first filing is due in just a few days, shortly after the filing deadline for the election, so I really do need to get with it. Filing for office of course is no guarantee of being elected. My late grandmother was a candidate for the school board in Challenge long ago, and lost by a single vote. Getting out any sort of message may be difficult. Unlike California, Nevada doesn't publish candidate statements in the voter guide. But I'll do what I can with the resources that I have. Mind you, it's not that much different than a volunteer work for Worldcon. Lots of unpaid work and meetings, and probably people who will be unhappy with you for not doing what they want you to do, while balancing too few resources against too many demands. But managing the fire district has a bit more on the line than running a Worldcon does. Update, 10 March: Clarified that the two open board seats are at-large and not individually contested, with the top two finishers getting the posts, and that if not more than two people file, they'll be automatically seated without an election because there is no provision for write-in candidates.